Drouin is 92 km south-east of Melbourne, on the rail and road routes from Melbourne to Gippsland. The town is supposedly named after a Frenchman who invented a chlorination process for the extraction of gold. Settlement in this part of Gippsland was retarded by the dense forest. Pastoral runs were taken up but little developed. In 1867, a coaching station was established on the track into Gippsland at Brandy Creek, about 7 km north-east of present Drouin. By the early 1870s, a small settlement had developed and land was being selected in the area. 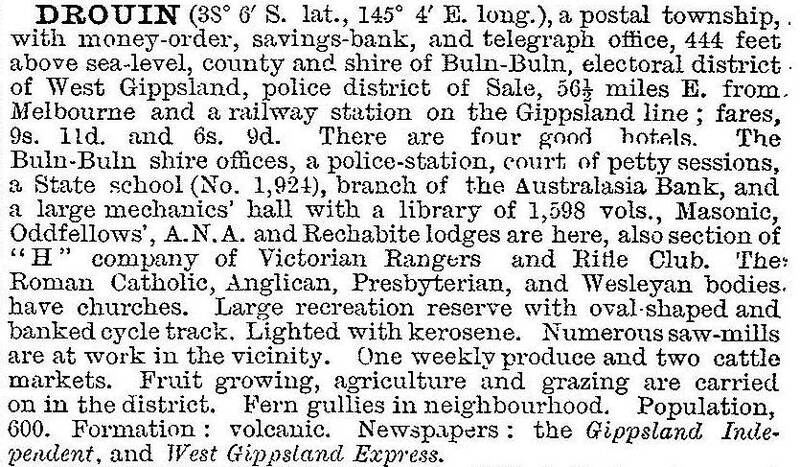 Meanwhile, contracts had been let for the construction of a railway from Melbourne into Gippsland. Workers' camps were set up along the route which passed to the south of Brandy Creek. There were three camps in the vicinity of Drouin. 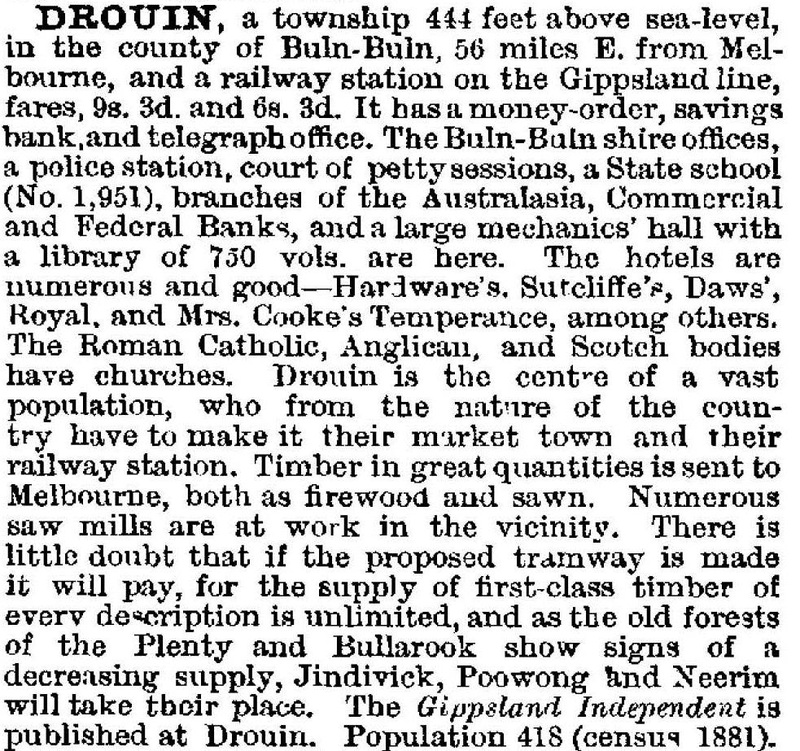 After the railway opened in 1878, a township was surveyed at Drouin Junction, soon known as Drouin. As Drouin developed, Brandy Creek declined. When the Buln Buln Shire was formed in 1878, the administrative centre was located in Drouin. As land was cleared dairy farming became the main industry. Initially, butter and cheese were made on the farm. A creamery operated from 1891 to 1895 and in 1904 a cooperative butter factory was established at Drouin. When this factory was extended in 1907 an electric light plant was installed which also provided light for the streets and homes of Drouin. The factory supplied fresh milk to the Melbourne market from 1915. Over the years the company acquired other dairy companies at Bayles, Cora Lynn and Iona and enlarged its own operation, producing casein, skim milk and butter oil as well as butter and cheese. It was acquired by the Bonlac company which got into difficulties leading to the closure of the Drouin factory in 2000. Flax was grown around Drouin during World War I and World War II. A private factory operated for a while and in 1941 the government constructed a factory to manufacture canvas goods for military use. The town has progressed steadily. From the 1970s, the subdivision of an industrial estate on the south-east edge of the town encouraged the growth of light industry. A number of housing subdivisons have also been initiated, as well as rural residential subdivisions on the fringes of the town. In the early 1990s the construction of a freeway bypassing Drouin allowed the remodelling of the shopping centre. Drouin has a compact civic centre between the railway station and the landscaped Civic Park. There are other reserves and a botanic garden further out. The primary school (256 pupils, 2014) is of a handsome State Public Works design, the secondary college (1956) is on the Korumburra Road (961 pupils, 2014) and the Catholic primary school (1989) adjoins Civic Park. Baw Baw Shire has a branch office in the former Buln Buln Shire headquarters. A Ficifolia Festival is held in February to coincide with the flowering of a splendid avenue of Eucalyptus Ficifolia at the western approach to Drouin. This avenue of honour was planted in the 1930s by school children for Arbor Day. Drouin Picnic Races are held each Boxing Day, continuing a horse racing tradition which started in 1880. In 2013 Victoria’s state planning minister released a planning blueprint that signaled population and employment growth in rural towns including Drouin.